(Blackwell/ Wiley, 2009) xi + 300 pp. Reviewed by Richard Matlak on 2009-11-10. This compilation of twelve multidisciplinary essays provides a scholarly review, and sometimes recommendations for future research, in a number of cultural contexts for nineteenth-century studies. As part of the series called Blackwell Concise Companions to Literature and Culture, this book can be compared to Part I, "Contexts and Modes," of the The Cambridge Companion to English Literature 1740 - 1830 (2004) but not to Part II of the same, "Writers, Circles, Traditions," since it does not separately examine individual writers. Nevertheless, this "companion" has the strength of multifarious learning and some surprising, though brief, applications to writers and literary works. Contributors treat religion, colonialism, nationalism, law, politics, theater, painting, poetry, fiction, natural science, natural history, social science, print culture, and consumer culture. Each essay concludes with a useful section, References and Further Reading. Though there is little unity in all of this multeity, the essays commonly show that some of the enormous facts of twentieth and twenty-first century life had their origins in or around the Romantic Age. Robert Maniquis's "Transfiguring God" revives a case for returning to the seminal importance of the Romantic imagination for young British writers who confronted the "unfathomable origin of violence" (22) unchecked by religion or reason during the Reign of Terror. Maniquis asserts that a belief in imagination gave writers the confidence to write with the same power as Burke and others who retained an orthodox or mystical belief in established religion or in rationality (25). As an extension of the latter, Maniquis reminds the reader that the spiritual crisis of John Stuart Mill derived not from a political catastrophe but rather from a loss of faith in rationality, which, he says, is not much different from a loss of faith in God. Lacking faith in religion or rationality, the human mind needs to find its hope in itself and this is the strength that Mill found in Wordsworth, who created a world, as affirmed by Coleridge, "undreamt of by the sensual and the proud." Saree Makdisi frames the Romantic period as the rise and fall of Orientalism in England between 1772, the year of Sir William Jones's "Essay on the Poetry of the Eastern Nations," and 1835, the year of Thomas Macaulay's scathing rejection of all things Oriental in his "Minute on Indian Education" for the East India Company (EIC). These publication markers in Makdisi's "Romanticism and Empire" are rhetorically effective but somewhat misleading because Charles Grant, an 18-year veteran of Indian service for the EIC and twice its director (1792, 1805), had been rejecting Hindu culture wholesale and as publically as Macaulay as early as 1797, which Makdisi briefly acknowledges. Nevertheless, Romantic writers were enamored of Oriental culture, and Robert Southey in particular became a victim of Macaulay's disdain for being a poet who seemed to have much in common with an Oriental culture that believes without reason, hates without provocation, and substitutes images for realities (54). Macaulay's strategy is to orientalize Southey and his infatuation for Indian culture as opposed to a British culture founded on science and discipline. Macaulay's imperial project towards India becomes less religiously inclined than Grant's and his Claphamite cohort. Macaulay's ambition was also more limited and realistic in its intent to eradicate ignorance, tradition, and prejudices only in the Indians the EIC had to deal with for the purpose of facilitating business and government. Anthony Jarrells's essay on the Enlightenment and Romantic historicism challenges the break still often posited between the two by viewing it through the lens of mid-eighteenth century Scottish historians. According to Jarrells, Dugald Stewart and others provided "the newly united kingdom with a narrative of Britishness" by means of conjectural history, political economy, and rhetoric and belles letters, all of which assumed continuity rather than disruption between the Enlightenment and Romanticism (60). It wasn't quite so seamless for culture at large, however, for a "National Intellect" of modern life and progress and a "National Feeling" of tradition and the uniqueness of Scottish history were played out in the Whiggish Edinburgh Review and the Tory Blackwood's Magazine. Interestingly, both journals could for good reason claim Walter Scott as one of their own. Emphasize the local color and deep attachment to tradition in Scott's fiction and tales and he is conservative; argue that traditional societies were moving forward through "stages" of development emphasized by Dugald Stewart--"hunting, shepherding, agriculture, and commerce," and Scott provides a narrative of national progress, as his postscript to Waverley (1814) shows (64). However, Jarrell finds "tales" the most interesting genre in foregrounding the debate over tradition and progress. John Galt's Annals of the Parish (1834), he argues, resists an Enlightenment narrative by furnishing the histories of local parishes. Romantic-period tales, he concludes, "offer narratives of human connections that resist the logic of progress and inevitability without rejecting it" (74) in historical writing that is both analytical and affective. Miranda Burgess organizes a great deal of scholarship and contemporary thinking on Romantic Nationalisms in Great Britain and print culture, which she joins by saying that "Romantic nationalism is, most fundamentally, a phenomenon of print culture" (82). More specifically. she agrees with Robert Crawford's argument in Devolving English Literature (2000) that the "professional, economic, and imperial ambitions of Scottish writers" got them heavily invested in the origins of British nationalism (87). One book in particular-- Hugh Blair's Lectures on Rhetoric and Belles Lettres (1783)--trained young men for making a living in London and participating in public life (89). But as Burgess notes, the role of Irish writers in England cannot be so easily explained. While Irish writers and intellectuals poured onto the London scene, they were not so much drawn by the call of opportunity abroad as driven by the lack of opportunity at home (91). Paul Keen maps out three dates of distinction for measuring the progress of liberty in the inter-related domain of politics and print culture: 1792, 1802, and 1818. In the serious political unrest of 1792 and 1818, a free and open press was deemed dangerous by the ruling class, all the more so when cheap and widely distributed (Keen makes the interesting point that seditious ideas could be tolerated as long as they weren't too accessible). In 1802, a comparatively calmer political period followed the Peace of Amiens and the cooling down of the reform movement. Print culture then experienced an important development in literary professionalism when the Edinburgh Review made the editorial decision to establish a constant political stance to combat Tory assertions that reason, philosophy, liberal ideals, and the republic of letters were a threat to society, as Edmund Burke had argued in his Reflections on the Revolution in France. Keen also notes that an obscure journal, John Hunt's Yellow Dwarf, challenged the government's suppression of the pamphlets of William Hone after he had been exonerated in his trial for blasphemous libel (112). According to the Yellow Dwarf, "It is the circulation of a work amongst the lower orders rather than the work itself, which . . . determines the guilt. . . . [A] paper which would pass unpunished if sold for a shilling, would be 'reprehensible' at sixpence-halfpenny, and 'literally poison' if sold for a penny" (113). The work of the radical press was to bring back Enlightenment rhetoric, "with its emphasis on the power of critical debate" to help form an educated public. Arguing that legal institutions would not have developed as they had without the "literary representation of justice" (137), Mark Schoenfield touches on law, a few novels of Austen, and other works that show the permeation of law into literature as well as the well known legal entanglements of Byron, Wordsworth, and Charlotte Smith. A particularly interesting section on the lawyer as public figure and parodic subject describes the types of narratives that the great criminal defense lawyer Thomas Erskine would employ in his clever, often dramatic, and usually successful arguments to the jury (130-31). Noah Heringman distinguishes between the status claims of "natural philosophers" and amateur scientists. The first were real scientists who studied physics, chemistry, astronomy, and mathematics; the second were amateur collectors and classifiers of "natural history[,]" who were merely gathering factual evidence about the history of man and the earth. But the amateurs had their uses. While Pope satirized amateur scientists in the Dunciad, their accretion of knowledge made natural history democratic and thus particularly Romantic. Natural history also begat a nature writing that popularized science in such works as Gilbert White's The Natural History and Antiquities of Selborne (1789) and Oliver Goldsmith's History of the Earth and Animated Nature (1774). Furthermore, to the consternation of natural philosophers, Joseph Banks became president of the Royal Society in 1778 even though he had no talent for physical science or mathematics and seemed incapable of publishing the results of his own research. Instead, it seems, he devoted his presidency to promoting the business interests of the mercantile class in bringing to market products discovered in exploration. An analysis of fossils and Charlotte Smith's Beachy Head concludes the essay with thoughts on the uneasy relationship between the social issues the poem introduces to contemporary geological theorizing which would soon lead to the "deep history" of Cuvier (162-64). "Beachy Head's insistent anti-pastoral attention to social inequality and war struggles against" the "risk of naturalizing the social history of that landscape" (163). In "Romantic Sciences," Frederick Burwick provides an encyclopedic overview of geology, astronomy, physics, chemistry, and medicine attuned to the spirit of the age, which in the sciences meant a shift from "matter-based physics to energy-based physics" (168). A large point of the essay is to show that contemporary science was an international endeavor. Geology challenged a biblical understanding of the earth's age and development with physical evidence that seemed to show, in the famous phrasing of James Hutton's Theory of the Earth, that "we find no vestige of a beginning---no prospect of an end" (170). By the end of the nineteenth century, the arguments of the catastrophists such as Cuvier (a Frenchman) and the uniformists such as Lyell (an Englishman) came together to form a narrative of both/and rather than either/or (170). Astronomy too was challenging in a comparable way a mythological heaven. The discovery of new stars, new galaxies, new planets, black holes, asteroids, and new comets, through scientific theory, inference, and enhanced technology made for a mental revolution as dramatic as the political revolutions of the Age. Experiments with electricity in the 1790s inspired the transformation of physics from matter to energy based (177). Here too internationalization was crucial for radical advances. The combined research and discoveries of Franklin, Priestly, Volta, Galvani, Coloumb, Schelling, von Arnim, and others led to physical laws and applied science that remains with us today: indeed, science that we are still building on, such as batteries, which in some future development might be the salvation of the natural world. For their part, chemists built on experiments in electricity and magnetism to establish atomic weights, periodicity, and the concept of "elective affinity" to explain why certain chemicals combine to form compounds. Dalton explained affinity with his atomic theory of ratios. Berzelius computed the molecular weights of more than 2000 compounds. Avogadro published on the molecular content of gases. In medicine, Burwick says, we find it not very surprising that an age given to the individual and subjective experience would make advances in psychology and mental pathologies. In fact, Joanna Baillie's brother Matthew was an eminent medical doctor who was elected to the Royal Society for his work on nervous conditions and brain pathology (183). Mesmer used his discovery of hypnotism to perform something akin to miracle in curing blindness in a young girl. Jenner discovered a vaccine for smallpox. Joseph Gall and Johann Christian Reill began what was to become and still is brain mapping. Burwick's fascinating survey of the history of Romantic science ends with his conclusion that "[d]evelopments in science . . . radically altered the sense of the human presence in the cosmos, in the physical dwelling-place of the planet, and indeed within body and mind" (186). He also provides fascinating animadversions to the influence of the sciences on British and Continental essays, novels, and poetry. In "Consumer Culture" Nicholas Mason examines the reaction of visitors to London's "shopping scene," which in scale was "unprecedented in world history" (190). Mason reviews the recent scholarly debate over a series of questions on historical consumerism: Did the consumer revolution precede and thus cause the industrial revolution? When was a consumer society born in England? Did consumerism signal a new stage in human evolution? (192) And at the meta level, How are responses to such questions influenced by a prevailing contemporary political and cultural climate, as in the 1980s, Thatcherism or Reaganomics? Debates aside, Mason illustrates the usefulness of consumer studies for literary criticism by briefly attending to passages from Wordsworth, Byron, Coleridge, Keats, and Shelley, but he saves his most extensive analysis for Jane Austen in a section on branding and the significance of pianos in the novels. "Austen," he writes, "truly excels as a historian of consumerism . . . in her depictions of how . . . certain goods take on . . . powerful symbolic and ideological resonances" which "come to shape their owners' identities" (204). The piano, for example, became invested with cultural value that "socially liminal groups, particularly the upper middle class and the lower gentry" sought as a "gateway to gentility" (205). Recognizing that families considered training in the piano essential for their daughters' entry into the world of courtship and marriage, Austen uses her female characters' musical ability as a "major characterization device" (205). In probing the nitty-gritty of Romantic Era publishing, Lee Erickson makes some arresting discoveries. The high price of paper during the Napoleonic Wars, for instance, drove the publication of poetry because lyric poems could stand re-reading and also took fewer pages than a volume of fiction (218). High priced paper also motivated improvements in the technology of the printing process, and as a result, stereotyping eventually altered the book trade. As early as 1802, Oxford University Press was the first publishing house to use stereotyping, which the Press sought out to capitalize on the Sunday School movement's insatiable desire for religious literature (224-25). In passing, Erickson notes that scholars of book culture have largely ignored the period from 1800 to 1830 (228), and among the subjects he lists for further research are Longman's records and archives. "The emerging study of book culture," he concludes, "promises to see Romanticism more clearly by integrating an economic and structural analysis of the book trade with a knowledge of the works it printed and with a psychology of the readers it instructed, inspired, and amused" (229). Comparable in its range to Burwick's essay on Romantic science, Gillen D'Arcy Wood's "Visual Pleasures" is an encyclopedic summary of belles arts and other entertainments. He surveys painting from Gainsborough to Turner, with a look at Gilpin and the picturesque along the way; he treats London theater and its principal actors, Kemble, Siddons, and Garrick rehearsing for Lear in the insane asylum of Bedlam, which was also one of London's public spectacles; and he also examines other unique entertainments that one might find--of all places--in Parliament, when Pitt, Burke, Fox, and Sheridan put their rhetorical flourishes on display. Wood's best example of the "theatricalization of politics" is the six-hour speech that Sheridan delivered at the trial of Warren Hastings, the first Governor-General of British India, which brought the house down (244). Finally, he treats the nationalization of art in the founding of the British Museum and the National Gallery of art, which were recipients of famous private collections that began an era of the wealthy elite taking responsibility for the taste and culture of the nation (253). Robert Kaufman concludes the volume with "What's at Stake? Kantian Aesthetics, Romantic and Modern Poetics, Sociopolitical Commitment." It starts off with asking why we bother to care about, or "waste time," on imaginative literature when there is so much more urgent work to be done in "a world that condemns untold millions to poverty, exploitation, and oppression" (257). In keeping with the etiological theme of this Companion, Kaufman reminds us that the topic of the usefulness of literature as a precursor to responsible action had its modern rebirth in the Romantic era, which revived the Classical debate between Plato and Aristotle on the social value of mimesis in effecting any positive good. The Romantics largely shared Aristotle's hopes for the transformative power of art as prior to knowledge and concrete action. But as Kaufman presents it, the Leftist critique of Romantic Ideology, which denies that Romantic art leads to anything outside of itself except for critical theory about itself (259), is itself a kind of effacement and denial of its true origins in Romantic aesthetic theory and poetry. Apparently autonomous art such as the passage from Wordsworth's Prelude, "Imagination - here the Power so called / Through sad incompetence of human speech" (Prelude 6. 592-93) is said "not only to privilege imagination and self-reflexive consciousness but to let them seem virtually to eliminate external sources of determination" (260). The informing philosophy for autonomous art is Kant's "purposiveness without purpose," which decouples art from action and prepares the way, as we find in Wordsworth's career or Coleridge's (if we are intent on misreading their careers), for the "depoliticization of art and literature" (262). Or so the argument goes. In Defence of Poetry, however, Shelley ingeniously argues that a great poet's politics are irrelevant because his language burns with the spirit of the age, as poets may "express what they understand not." Kaufman points out that twentieth-century artists on the Left, Brecht and others, have adapted Shelley's argument verbatim (263), which of course means that they have begat a "terrible unintended irony" by seeming to reject but relying significantly on "the resources of Romantic aesthetics and poetics" (263). How might this Companion be used? Advanced undergraduate and graduate students could use any one of these essays and its accompanying bibliography for developing research papers and theses. Scholars who want briefing on one or more of the areas covered will also find the volume useful. The essays of Maniquis, Heringman, Keen, Burwick, Mason, and Wood are broadly significant and would be excellent reading assignments for introductory courses in Romanticism, making this Companion a good buy for the institutional library. It can also be purchased as an e-book, although it is $99 in either form. Richard Matlak is Professor of English and Director of the Center for Interdisciplinary and Special Studies at the College of the Holy Cross. His most recent book is Deep Distresses: William Wordsworth, John Wordsworth, Sir George Beaumont, 1800 - 1808 (2003). He co-edited with Anne Mellor the anthology British Literature: 1780 - 1830 (1996). He is currently working on an essay entitled, "Wordsworth and the Ethics of Voyeurism." 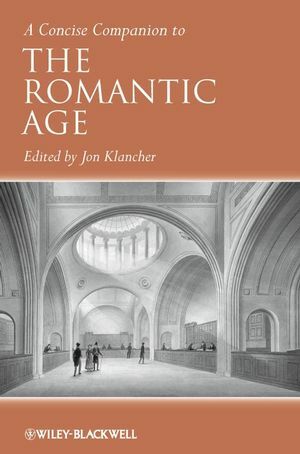 As editor of this volume, I appreciate Richard Matlak's careful summarizing of its 12 new and stimulating essays on various aspects of Romantic period literary and intellectual history. It's at least half of a reviewer's task to give his reader a close-up and reasonably detailed account of a collection's individual essays. Matlak fulfills this task, but he doesn't quite get to the other half--to assess whether the volume fulfills its stated aims. Indeed, he doesn't seem to have read my Introduction at all, or at least he gives no evidence of having done so. Instead, Matlak calls the volume a "compilation" and, echoing time-honored Coleridgean terms, says it has more "multeity than unity"--an apparent fault. My introduction could have forestalled Matlak's impression that the volume has no design, but that would require his having read it. In a 13-page introduction, I clarified why the volume is divided into two parts. The first six essays range across key topics in the period as a whole--religion (Robert Maniquis), politics (Paul Keen), nationalism (Miranda Burgess) , empire (Saree Makdisi), enlightenment (Anthony Jarrells), and law or justice (Mark Schoenfield) in the Romantic age. These are clearly historical and sociocultural categories; some, like law or religion, have been less addressed in recent Romantic scholarship than one could wish. Others, like nationalism, empire, enlightenment, and politics, have been key categories for historicizing and culturally situating the romantic period in a wider framework of modernity. This volume appears in 2009 at a moment that's clearly in the wake of the dominance of historicism and cultural studies in Romantic scholarship, so I planned it to address those recently emergent areas of interest, while equally accentuating areas that should be part of a serious socio-cultural perspective (such as the history of religion, or matters of justice and law). What Matlak also missed was the intent of the volume's second half--to turn from broad matters of history, culture, and politics towards new or emerging knowledges in the period, thus accentuating its concern with intellectual history as opposed to individual writers and genres. Hence we find new and provocative essays on "natural history" (Noah Heringman), "the sciences" (Frederick Burwick), the "arts and entertainment" (Gillen Wood), book and print history (Lee Erickson), aesthetic theory (Robert Kaufman), and commerce/consumer society (Nicholas Mason). Whether they led to modern disciplines of knowledge or remained "predisciplinary," these emergent forms of knowledge spread across the print and oral genres of the age. Today we grapple with all six of these (and others, of course--Blackwell asked me to be selective!). I'm sorry Professor Matlak couldn't find a complex unity in this range of topics and performances, though it's good to see readers finding "multeity" and diversity of topics and close readings in any event. He also leaves the impression that the volume doesn't often enough address individual writers or genres. I wanted the volume to accomplish something different than the customary survey of writers and genres we still associate with a "companion." Thus my introduction points out that every essay, in fact, focuses on particular genres or writers to make its arguments. Jane Austen appears prominently in chapters 1, 9, and 11 (on consumer culture, art and entertainment, and religion); Walter Scott in chapters 3, 4, and 10 (on enlightenment, nationalism, and book history); William Blake in chapters 1. 2. and 12 (on empire, religion, and aesthetics). How about the novel or poetry? Try chapters 3-5 on the novel and chapters 1, 7, 12 on poetry. There is equal attention--rather more focused than the term "multeity" suggests--to the caricaturists (Thomas Rowlandson, chapter 11), the scientific masterminds (Joseph Banks, chapter 7), the historiographic headliners (Thomas Macaulay, chapter 2), the national tale-writers (John Galt, chapter 3), and many other lesser-known cultural producers of the age. I'm quite happy that my first-rank contributors could work out so effective a trade-off between well-known and little-known Romantic age cultural and literary phenomena. Maybe Matlak could give the design and execution of this volume some further thought! Leave a comment on Richard Matlak's review.